Eating Nebrodi Black Pig Salami matched with a crispy slice of bread is a real high refined experience. 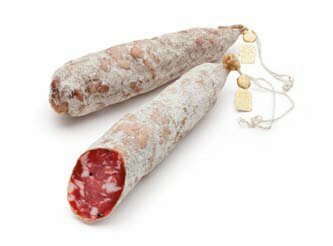 You do not need to make matching with excellence products because our salamis are just the excellence. We are not exaggerating. We take care of our salamis during each stage of manufacturing. Knife point! Do you know what it is? It is an ancient method that we still use today to cut the meat. We cut EACH BIG GRAIN manually. Do you know why? Because it gives the salami a compact and homogenous texture. The so-cut meat is seasoned with natural aromas (salt, pepper, wild fennel). Then it is wrapped into a big bowel and at the end it is seasoned for almost 90 days. Appearance: Cylindrical and irregular with one end thinner than the other. Appearance on slicing: The slice is compact with a nice deep red colour with rose coloured lard. Trivia: The Black Nebrodi pig lives in the wild and feeds exclusively on acorns and chestnuts.